Living on an Island, water has always had a large effect on me. Seeing the water everyday brings me calmness and times in my life when I am not around it I can feel it in my body. I know wherever I live I know it will have to be near the ocean. I have always thought it would be amazing if everyone used sailing, rowing ect.. as a means of transportation for people and for transporting locally gown food around the islands. This weekend I was reading a local newspaper and found and article talking about just that, a small cooperative that transports food by sailing. I thought it was amazing. 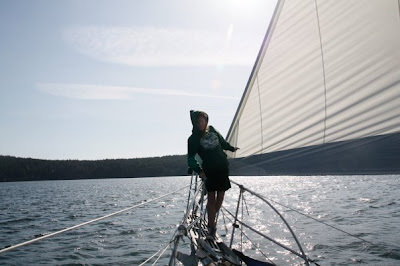 "Salish Sea Trading Cooperative, a Ballard non-profit, relies on wind and tide to transport locally produced goods around Puget Sound by sailboat." Such a wonderful idea and so happy to see this idea really being used.